Editor’s Note: Thiago Terzi is the founder of The Commodity Innovation Lab, a group that partners with organizations seeking to monetize data, establish new and creative paths to strategically harvest proprietary data, and reduce overall data cost. Here he discusses how traditional agriculture coops can stay relevant in the age of digital agribusiness marketplaces. Many agricultural cooperatives are facing challenges with respect to globalization, industrialization of agriculture, the democratization of technology, and competition from large multinational corporations in the agrifood and forest industries. Agricultural cooperatives are formed by a group of producers in order to bring a given product (or products) to a wider market. Cooperative members are then able to share the social and economic success of this marketing strategy as well as more evenly share any risks experienced throughout the duration of the season. In addition, member producers are able to pool the funds and manpower necessary to process or harvest their goods. 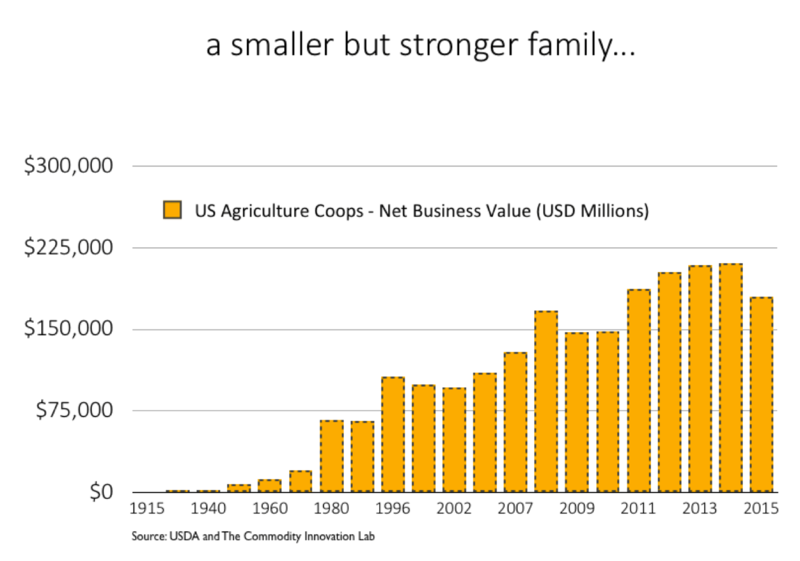 Therefore given the business size and their entrenched value to rural communities, US agriculture coops have become part of the fabric of the rural US. Combined, they are the country’s largest agriculture merchants and originators. Coops are dependent on annual enrollments to maintain the “scalability prophecy” alive and expand services to increase farmers dependability for a business that is in general, highly commoditized. Loyalty and commitment are key values in a cooperative environment. They are absolutely necessary for the success and adaptation of coop enterprises. These two values not only refer to the consistent patronage of cooperatives but also their participation in decision-making, investments, and contribution to the firm’s development. Members’ commitment and loyalty are necessary for the adaptation of the cooperative in an ever-changing economic and institutional environment. Member loyalty and commitment are often expressed as “social capital.” The social capital created within the organization has been claimed to be the most valuable asset of cooperatives. But the same network fabric that has sustained its existence since the 1920’s is beginning to question the future of its value proposition. What makes a farmer loyal to a coop? Are coops becoming part of the change that the 21st century farmers seek? Individualist ethic that has increasingly entrenched itself within our Western culture. Smaller and/or less profitable Coops are disappearing and mega Coops are emerging. Top 10 Coops have experienced an increase in membership of 10.14% in a single year (from 2014 to 2015). Adding to the fire, net farm income is declining as the average farm debt-to-equity ratio climbs and price forecasts (Corn) are not showing a much positive sign for current and upcoming years. Several technology companies venturing into developing domestic or global agribusiness marketplaces combined with an improved and cheaper access to communication tools (WhatsApp, Skype, Message) have allowed farmers to look over the fence. Farmers have always had the will to go directly to their customer, but now they have a new partner, technology, allowing them to seek an independent route to increase profitability on their own terms. If farmers want to begin to have better control of their own future than we should look no further than on-farm storage. On-farm storage empowers farmers to dictate when to sell, departing away from seasonal pricing drops. On-farm storage pays big dividends on marketing strategy but it also helps indirectly on managing input prices by storing fertilizer and chemicals for a full crop year avoiding unexpected seasonal peaks. Beyond that, farmers gain time. When there is no need to rush the crop for hauling, farmers have time to better think about their own business by researching and incorporating new best practices. For the past five years, the percentage of on-farm storage has increased in relationship to total storage, from 53% in 2012 to 57% in 2016. Lack of available employment, especially when it comes to labor-intensive crops such as horticulture, dairy farms and perennial crops, has also pushed farmers to seek efficiencies elsewhere. Based on already approved immigration bills and proposals sitting on US Congress, an increase in US immigration barriers looks likely and will only strengthen the case for alternative solutions. Coops can be a place to adapt and disperse technology innovation. Unfortunately, in most cases, adoption has been slow due to a lack of a technology embedded in coop culture. Create a Data / IT-driven board: Develop a technology data culture to nurture innovation from top to bottom and therefore encouraging a bottom-up innovation environment. Improve communication with farmers: Use new and varied tools to keep in more frequent contact with member farmers. Extend your legal relationship with your farmers by adding data to this new equation: On paper farmers work very hard to generate a single data acreage output. It is time to allow them to benefit by expanding the legal rights framework. Develop new services for members and non-members: A data-driven coop will find itself in new territory, allowing them to quickly envision new service offerings driven by the speed at which they can learn and incorporate new technologies. Develop an “open source” and fair value-driven marketplace: This channel must connect members and non-members to openly trade goods and eventually goods and services. Success in these areas could engage a new generation by promoting data transparency and present coops with the opportunity to eventually expand into regional tech solution hubs. 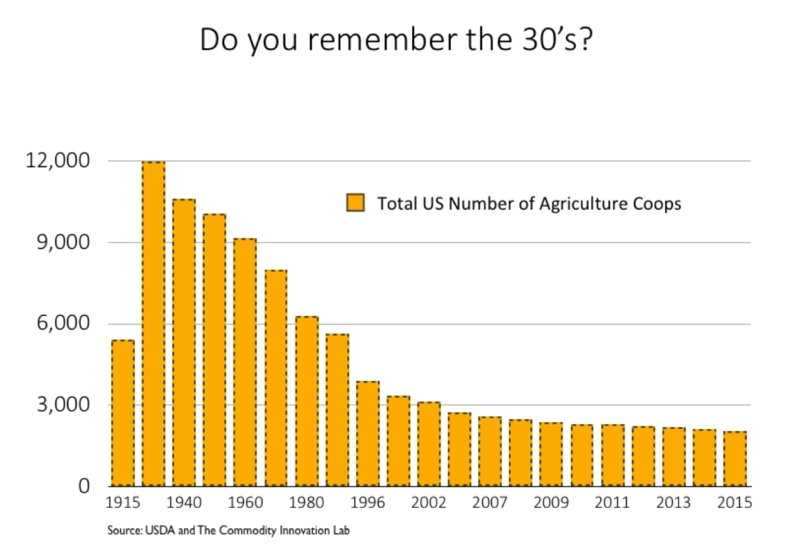 The coop that once existed is no longer, but if trust and services are still a strong currency then a new coop is set to emerge and address the next farmer generation. The old currency was trust. The new trust is data. How Do Farm Hackers View Venture-Backed Agtech?